There are certain habits, five to be exact, that can ruin your windshield. And a poor windshield is prone to damage. Since that could potentially lead to a windshield repair San Diego, you must quit these bad habits as a preventative measure. Sponges and towels might feel soft, but not on your auto glass. Using sponges and towels to clean your auto glass could be the worst technique to use. Sponges are designed to scrub out hard-to-remove stains from grimy dishes and other kitchen tools. Therefore, they are not soft. Cleaning our cars with them could scratch the glass and dull the paint little by little. Regular towels, too, are not smooth because of the material they are made of. When we dry our hands with them, they do not affect us. However, if we use towels to dry our cars, we could be scraping at the paint and glass. You cannot end the habit without an alternative method to cleaning your car. So, what can you use in place of sponges and towels to prevent a windshield repair San Diego? Get a microfiber cloth, of course! Purchase two of this soft cloth and you will have two items in place of the sponge and towel. Peeling a car sticker or decal with keys is a horrible idea! You peel the decal by hand, and then the sticker breaks off. And when you eventually cannot take it anymore, you reach for your car keys and use them to scratch out the remaining sticker and glue. This habit can cause you to scratch your windshield and windows, so it is clearly not good. 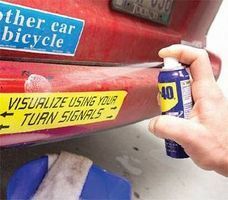 Instead, spray WD-40 on the sticker or decal that you want to remove and let it set for a minute. After that, you can easily peel the rest of the sticker with your fingernail and remove the remaining glue faster. This is a common habit among young drivers. When your windshield wipers are old, your rubber blades wear-out and crack, and you should never keep them in use. They have done their time and need to be thrown out. Continuing to use them during rain can be highly damaging to the glass, so much so that the windshield could shatter altogether. Therefore, if you want to steer clear from a windshield repair San Diego, install new wiper blades. Unless you are an expert when it comes to auto glass, do not tint your car by yourself. You need the right tools and the proper, legal tinted glass or film. Besides, you do not want to make mistakes when you tint the glass, so it is best to leave this to the auto glass professionals. Ending these five habits when dealing with your car will change your life and prevent a costly windshield repair San Diego.